The care and feeding of running gear. Trying to get the best performance! PropSpeed is a coating for running gear that allows components to slip through the water with less friction, thus making them more effective. Preparation is critical for the application of PropSpeed! 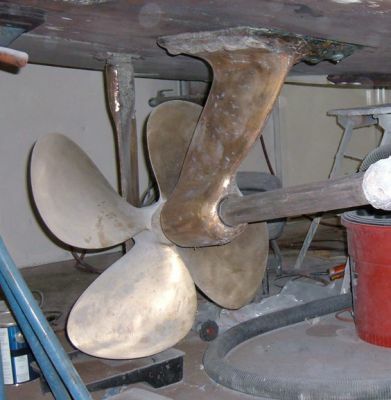 Idealy this coating would be applied when the boat is new since the gear needs to be "Clean as New" for the application. Dave is taking off all foreign product on the gear and getting it down to bare metal. Once we were down to bare metal it will be scrubbed with a sponge and water, wiped down with clean towles, and finally, wiped with clean white cloth soaked in acetone. When the cloth can be wiped on the gear and remain clean, then, and only then, the gear is ready to be coated. Preparation is the time consuming part of this operation. PropSpeed is a two part system. The first part is an etching primer and the second is a clear coating. We have no pictures of the actual application. The application timing is critical and because it takes two people we did not have a photographer. Shaft, struts, props and rudders are coated. Dave applied the etching primer and I followed approximately four minutes behind with the clear coat. 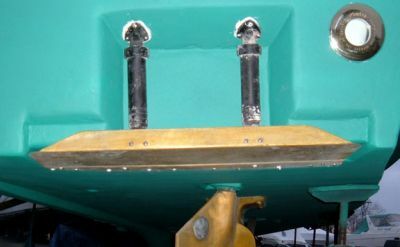 We also coated the trim tabs. 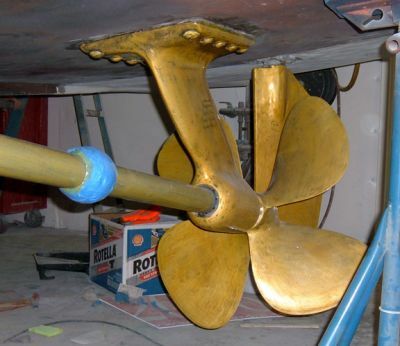 With PropSpeed applied, the props will slip through the water with ease and make this boat more efficient. Additionaly, any growth on the gear should slip off when the boat runs. The product can be easily installed on new props. 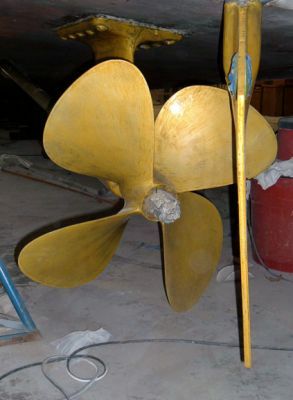 Should we find the need to change props during our sea trials we will test with and without propspeed. 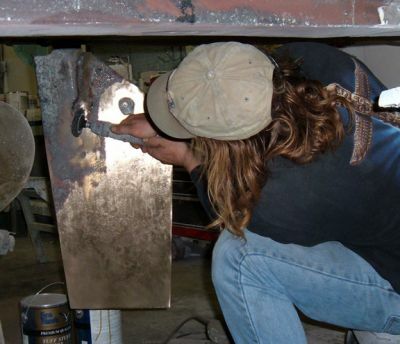 October 8, 2009 We pulled the boat to varnish the transom, clean the bottom and change the zincs. And change the zincs we did! We changed to "Performance Metals" Navalloy*. 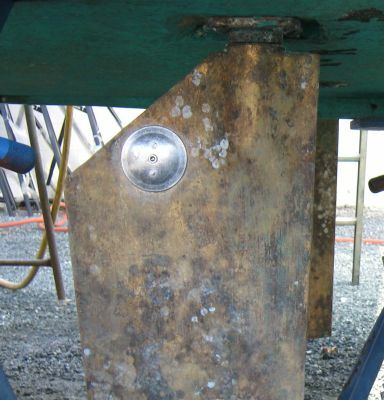 This Aluminum/Indium anode promises better protection and longer life. 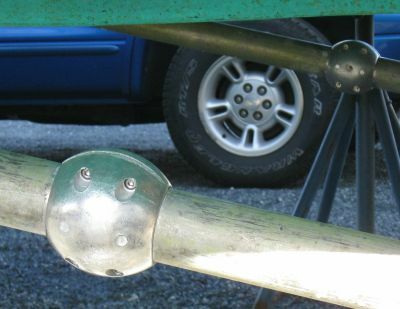 When installing the anodes I was surprised they did not contain the normal brass ball or brass contact found on normal zincs for "better" contact. 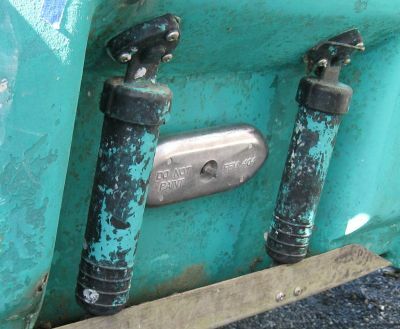 What I was told when researching this was that the aluminum is a great contact and there is no need for them. The powdery area on the shaft all around the ball when removing an old zinc is caused by a problem the ball actually creates.